Racial and political graffiti was sprayed on the side of the space shuttle Independence replica at Space Center Houston on Wednesday, Nov. 27, 2013. 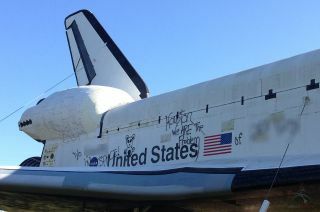 A replica of a NASA space shuttle on display in Houston was defaced Wednesday (Nov. 27), when vandals sprayed racial and political graffiti on the side of the full-size mockup. The offending markings were quickly covered over within hours of their being found. "Unfortunately, someone vandalized our high-fidelity mock shuttle," said Melanie Johnson, the director of education for Space Center Houston, the visitor center for NASA's Johnson Space Center where the model is located. "They wrote some offensive words and political statements." The mockup space shuttle "Independence" as seen at Space Center Houston after repairs were made to remove and cover up the graffiti left by vandals on Wednesday, Nov. 27, 2013. "To the person who did this — you really need to check yourself, because you're making it bad for all other decent people in this town," the driver told Houston CBS-affiliate KHOU. By 2 p.m. CST (2000 GMT) Wednesday, visitors to Space Center Houston were posing in front of the shuttle with no indication of the graffiti still visible. "We immediately reacted and responded to it by covering up the derogatory terms, and then the secondary words as well," Johnson told collectSPACE.com. "Now the shuttle's back, it's been painted over." Space Center Houston officials alerted the Harris Country Constable's Office and filed a police report. The 123-foot-long (37 meters) space shuttle replica, which in October was christened "Independence" as the result of a statewide naming contest, arrived in 2012 from NASA's Kennedy Space Center Visitor Complex in Florida, where it had been on display for 18 years. Though currently exhibited on the ground atop pedestals, Space Center Houston has announced plans to mount the Independence atop NASA's historic Shuttle Carrier Aircraftas part of a new $12 million, six-story attraction scheduled to open in 2015. The modified Boeing 747 jumbo jet was used to ferry the orbiters across the country following their return from space. The original Shuttle Carrier Aircraft, referred to by its tail number NASA905, was retired in 2012 after delivering the shuttles Discovery, Enterprise and Endeavour to Virginia, New York and California, respectively, for public display. "We're going to rise above this and keep moving forward," Johnson remarked. "We are going to have the opportunity to teach hundreds of thousands of more people about the space shuttle."